The extension aims to be as theme-friendly as possible. Although the dock appearence is inherited from the default dash ensuring always basic theme support, some themes target dash to dock specifically. For more information on the theming support visit the theming development section. An extended Adwaita, the default theme, is available. Compared with the defaut theme, this theme only applies minor changes to the dash as shown on the screenshot. reduce the padding to save space. and adds dots indicating running application. 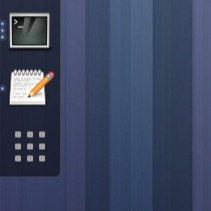 Prior to version 29 a dedicated theme - Adwaita-dashtodock - was developed. Since version 29 this is built in the extension and can be enabled from the extension setttings. For previous versions, the theme can be downloaded from the [theme development page] (https://github.com/micheleg/adwaita-dashtodock). If you know or you authored a theme supporting dash to dock and you want to see it listed here, please contact me.